If you’re not 100% sure what a dryer ball does, this is the guide for you. While some green cleaning replacements are used the same way as their more mainstream counterparts, others have a bit of a learning curve. But don’t worry, I’m here to talk you through the trickier products. So break out the mop and let’s get down to it. Most of the all-purpose cleaning sprays you can find on supermarket shelves come with a lot of excess plastic packaging. Even the “super concentrated” kinds can usually cut back a bit more. After all, if you have water at home, what’s the point in paying for it at the store? And why do you have to keep buying the same plastic bottles you’re just going to have to throw away over and over? Powdered cleaners like the Meliora’s All Purpose Spray-Cleaner are a much better option, once you get the hang of them. The starter set comes with a reusable glass spray bottle and a refill canister of the powdered cleaner base. You may not be used to mixing up your own cleanser in the bottle, since most commercial cleansers come pre-mixed. That’s fine. The process is actually super simple and takes less than a minute start to finish. All you need to do is add one tablespoon of powder to the empty spray bottle, then fill it up with warm—not hot—water and shake, shake, shake. I like to fill my bottle about one-third full of water and shake it until the powder dissolves before adding the rest of the water. In time, you’ll find your favorite method. Once you’ve mixed up your bottle of cleaner, use it just as you would any other all-purpose spray. A single refill container is enough for 18 bottles of natural, eco-friendly, and preservative-free cleaner, so don’t be afraid to use it everywhere! This product was a real eye-opener for me. You can wash your dishes with a solid soap? Who knew. Now that I’ve tried it, I actually really like it- and I think you will, too! My favorite thing about this solid dishwashing soap is that you don’t have to drop what you’re doing and fumble around trying to get a grip on a slippery plastic soap bottle every time you need a top up. 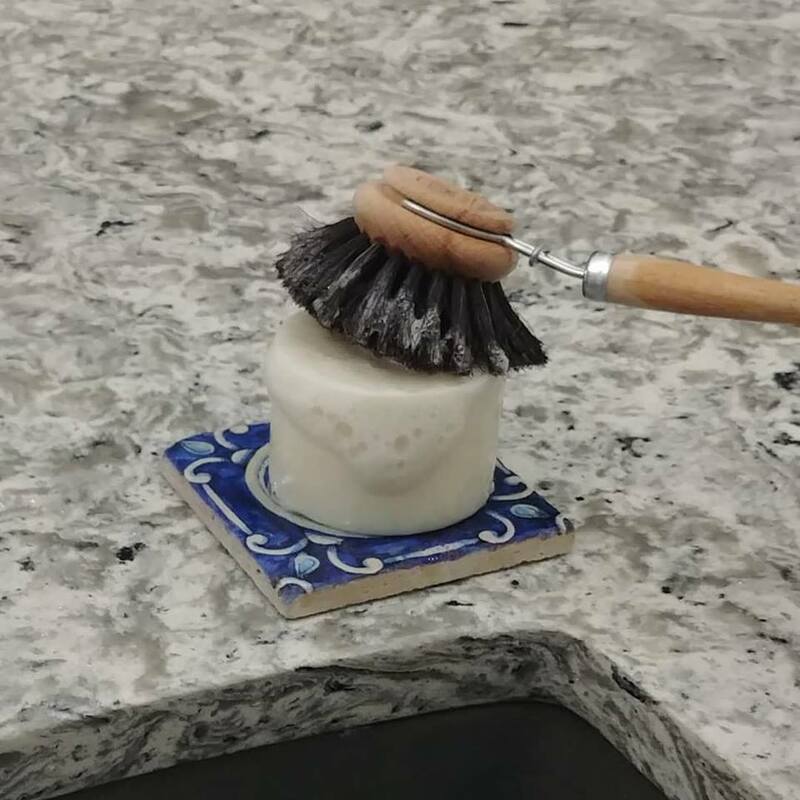 With this, you just swipe your sponge or dish brush any time you need a bit more soap and that’s that. You don’t even need to put down the casserole dish in your other hand! If you’re someone who likes to squirt a little soap into the bottom of a particularly intimidating dish, fill it up with water, and let it soak for a while, you can still do that. Instead of placing the soap in the dish first, you’ll just let the warm water run over the soap puck while it’s filling up. It will still get plenty bubbly in there, and you’ll use way less soap than you would with the liquid! If there is a more versatile cleaning product than castile soap, it must not have the enormous fan base that Dr. Bronner’s has. If you’ve only heard the buzz about this famous liquid castile soap, you might not have a clear idea what it is, since fans cite uses for it that range from tooth brushing to pest-repelling plant spray. This simple soap is one of the best selling natural cleaning products because of this versatility. Its packaging states 18 different uses for the stuff, and enterprising consumers have found even more. The trick is in finding out how exactly the soap is meant to be used in each different application. In most cases, the difference just comes down to dilution. Here are the dilution rates for some of its most common cleaning applications- including mopping, window washing, cleaning toilets, and even for bathing your dog! Yes, I’m going to give you the inside scoop on dryer balls. I wouldn’t leave you hanging on that one. Dryer balls, like these from CleanCult, are essentially balls of felted wool that you toss into your dryer along with a load of laundry. They’ve been gaining popularity in the last few years, and a lot of conscious brands are adding them to their lineup of products. As for what they actually do, it’s simple. As they bounce around in your tumbling dryer, they agitate the clothes inside, teasing them apart which leads to faster drying times, reduced wrinkling, and less static. Many people use them as a replacement for dryer sheets. If you find yourself missing that “laundry” scent, you can even put a few drops of essential oil on your dryer balls, which will transfer to your fresh load.